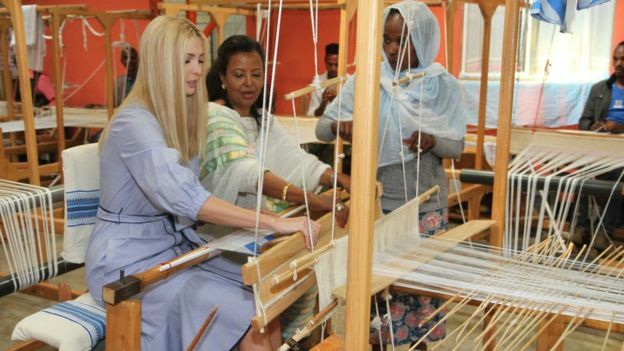 The beautiful Ivanka Trump, daughter to US president Donald Trump is in Ethiopia to promote a US government program aimed at advancing women’s participation in the workplace. The initiative is believed to benefit 50 million women in developing countries by 2025. 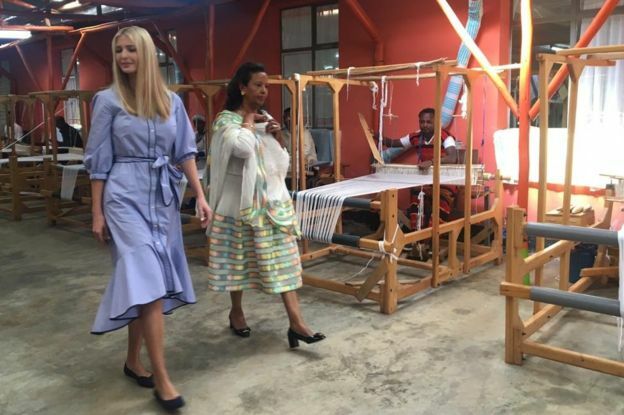 Ms Trump’s first stop was a female-run textile facility in the capital, Addis Ababa. She visited Muya Ethiopia, a clothes manufacturing company. The 16-year-old company, which exports clothes to the local and international markets, was founded by Sara Abera, who gave Ms Trump a tour. Her work visit falls under a $50m (£38m) financed fund within the US international development aid agency (USAid) via The W-GDP initiative which aims to train women worldwide to help them get well-paying jobs. She will soon be in West Africa, Ivory Coast to be specific later in the week and is set to visit a cocoa farm, as well as participate in a meeting on economic opportunities for women in West Africa.